The great wheel of time is set to spin once again, with January marking another fresh cycle in the course of human events. It also means that on the smaller scale of things, a new lineup of content is heading over to Netflix for all subscribers to behold. While we’ve already gone over the full list of what’s headed our way, the following 10 titles are of particular interest. Some beloved classics, and more modern favorites, are headed to the Netflix streaming library, and throughout January you can catch these near and dear films through the courtesy of your own subscription. One has to wonder what was going through Christopher Nolan’s mind when he was moving through all phases of production on The Dark Knight. What was once seen as a promising idea for a follow up to Batman Begins quickly became a fan-adopted classic, and it’s only been a decade since the film was first released. This title seems to be in and out of the Netflix library, like any of Gotham City’s rogues gallery of villains and their many trips to Arkham Asylum. But unlike any of those nutty funsters, this is a return that’s most celebrated. If you ever want to hear a story of rags to riches in the movie industry, ask someone to tell you the story of Hell or High Water. Originally released as an extremely limited indie film, this western noir masterpiece went on to become more of a success than it was expected, and eventually went on to become an awards season player. Gumption and grit define this movie on the inside and out, as Chris Pine and Ben Foster play brothers knocking over banks for a very specific reason, with Jeff Bridges being one of the men hot on their trail. Sharply written, and expertly acted, this one’s a fun night home with a couple of beers and smart-assed conversation. The internet loves to argue over sequels, and the Indiana Jones series is one of those hotbeds of discussion that never totally fades away. Many folks favor Indiana Jones and the Temple of Doom as their favorite sequel, while others would make the more logical choice and go for Indiana Jones and the Last Crusade. 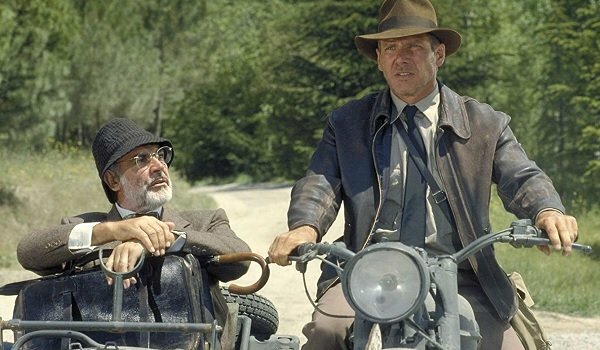 While the more overriding point here is that the entire Indiana Jones series will be on Netflix at the same time, and Raiders of the Lost Ark is the obvious favorite of the world, let’s not forget that this is the movie that gave us Sean Connery and Harrison Ford as father and son. It may not be Thanksgiving, but there’s always something to be thankful for. Guillermo del Toro and Netflix are like hot chocolate and marshmallows. So obviously, this cocoa-esque collaboration would bring us Pan’s Labyrinth in the month of holiday festivities. Much like his entire filmography, you can definitely get a spooky vibe from what’s arguably del Toro’s best film. But looking closer, you’ll see that it’s actually a richly told fairy tale for adults, dissecting the horrors of war and the ugliness of reality with an intriguing underworld lying beneath it. To think that we almost had a more studio-friendly version of this film is the true horror, and it’s a good thing Guillermo del Toro stuck to his guns, and gave us the exact version of Pan’s Labyrinth we will be able to see on Netflix in January. Next year marks the year The Addams Family will return to the big screen, albeit it will be through the courtesy of a CGI cartoon reboot that looks closer to the art style of the original Charles Addams comics. And yet, no matter how good that film will potentially be, Barry Sonnenfeld’s live-action adaptation will always have a strong hold on fans of all things mysterious and spooky. It’s the kind of thing that happens when you nail the tone of the world as well as they did in the casting of Gomez and Morticia with Raul Julia and Anjelica Huston, respectively. If it’s always Halloween in your house, you’ll have no problem enjoying this one in the dead of winter. File the impending addition of The Departed to Netflix’s streaming library as another one of those fun bits of foreshadowing for 2019. With Martin Scorsese’s The Irishman set to be released at some point in the next year, it seems only fair to release the film that won the director his first (and so far only) Best Director Oscar. Of course, since Netflix is always on the hunt for another golden trophy to put on their mantle, releasing this darkly comic drama involving a cop and a gangster both pulling double agent duty could also be part of their own internal vision board. After all, The Departed won Best Picture, so who’s to say The Irishman won’t? Keep thinking big, guys! How quickly we forget a good time. Just last year, Universal tried rebooting The Mummy franchise as the first part of the Dark Universe debacle. While it could have been an interesting exercise in concept, it fell so flat it could be considered two dimensional. Meanwhile, The Mummy Returns, and its predecessor The Mummy, are being brought onto Netflix’s platform, as if to remind us of simpler, more adventurous times. Everyone could use a little more banter between Brendan Fraser, John Hannah, and Rachel Weisz in their lives, and that’s exactly what you’re getting here — with a side of Dwayne “The Rock” Johnson’s big screen debut. Let the decades fall away, and pretend it’s the early Aughts again, in the privacy of your own home. Zack Snyder’s best film in his entire career is Watchmen. Full stop. Look, I know this is my opinion, but you can rant about how the ending was changed, and you can poke fun at the speed ramping or that odd usage of Leonard Cohen’s “Hallelujah” all you want. But the fact still remains that Snyder really got what Watchmen was all about, and what it needed to come to the big screen. Now, it’s not indicated whether this will be the superior Director’s Cut, the slightly over-stuffed Ultimate Cut, or the shortened for commercial viability Theatrical Cut. That being said, all versions of the film still have the heart and soul of Alan Moore and Dave Gibbons’ alternative history epic, and it’s something truly special to behold. After announcing that the entire catalog was heading to Netflix, the day Monty Python fans in the U.S. have been waiting for has finally arrived. Monty Python and the Holy Grail is a comedy classic so storied that it not only remains as funny today as it did back in its original release, but it has a musical adaptation. When you get to that point without being taken down by post-modern think pieces, or just a general opinion of “it wasn’t as funny as we thought it was back then,” it’s worth noting. If you’ve seen it, see it again. If you haven’t, or know someone who hasn’t, isn’t it about time they did? January is an embarassment of riches for Disney studio content on Netflix, as both Solo: A Star Wars Story and Ant-Man and The Wasp will both be coming online through the month, even as the Netflix and Disney deals wind down. In classic Disney form, however, the company has gone and saved its best offering for last. Incredibles 2 isn’t just one of the best animated films of 2018, it’s one of the best films of the year. Not to mention, it’s one of the best sequels to have ever come out after a lengthy wait — in this case one that spanned over a decade. It’s the perfect cherry to an incredible January, so make sure to save room for the most super dessert you could ever have hoped for!